As a president and founder of Global Insight Corporation, Masato (Matt) Nagase supports customers in creating businesses in the areas of aerospace and defense. Mr. Nagase retired from Mitsubishi Corporation (MC) after 36 years of work for its aerospace, defense and cyber security businesses and founded Global Insight Corporation in December 2011. Since 2006, Mr. Nagase was Deputy Chief Operating Officer of MC’s Ship & Aerospace Division. He also served a trustee of Defense Structure Improvement Foundation (BSK) and Satellite Positioning Research and Application Center (SPAC), a board member of National Spacial Data Infrastructure Promotion Association (NSDIPA), Mitsubishi Precision Company (MPC) and Mitsubishi Space Software Company (MSS). In 2001, Mr. Nagase founded Infosec Corporation where he served the President and CEO. Together with its partner firm LAC, Infosec provided Japan's first full-fledged Security Operations Center (SOC) services for Japanese private enterprises, and the first real-time security monitoring capability for the Ministry of Defense (MOD). Mr. Nagase began his career at MC’s Aerospace Department in 1975 and engaged in variety of military projects such as air defense missiles, airborne and naval electronics and training devices. In 1990 he was posted to Washington DC office as a deputy office head and served as a liaison with the U. S. government agencies and international organizations. He endeavored to promote Japanese participation in the Strategic Defense Initiative (SDI), today known as Ballistic Missile Defense (BMD) through the participation in the Western Pacific Missile Defense Architecture Study (WESTPAC), a historic first research contract awarded by the Department of Defense (DOD) to Japanese defense industry. 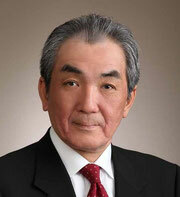 Mr. Nagase graduated from Massachusetts Institute of Technology in 1975 (B. S. Electrical Engineering). He currently serves a board member of the Institute for Future Engineering (IFENG) and an advisor of Japan Forum for Strategic Studies (JFSS).